Where to live in Austin, Texas? Shady Hollow Austin is one of the most-coveted neighborhoods in the Lone Star Capital City. Here are the top reasons why. 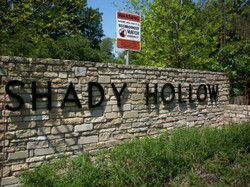 Where in Austin is Shady Hollow? Shady Hollow Austin, a census-designated place in southwestern Travis County, is a beautiful neighborhood located about 10 miles southwest of Downtown Austin. Thankfully, back in the 1970s, the Shady Hollow homeowners association prevented the banks from over-developing the area. This resultet in a preservation of generous park land with expansive green spaces and marvelous old-growth trees. Since the 1980s, this South Austin neighborhood is owned and managed by the Shady Hollow Homeowners Corporation, and they make sure that nothing bad happens to the place. Good. Capistrano Park and Pool is the home of the Shady Hollow Stingrays. Don't worry - it's the swim team. You'll find tennis courts and pretty playscapes for kids. You may even rent the event facilities at the neighborhood center for your anniversaries, weddings, birthday parties and other celebrations. Living in Shady Hollow has a country-feel to it, although shopping malls and downtown entertainment are within easy reach. As a census-designated place, Shady Hollow has lower tax rates than the City of Austin. The neighborhood is served by award-winning schools: Baranoff Elementary, Bailey Middle and---one of Austin's top educational institutes---Bowie High School. Drive away from the city and enter the beautiful Texas Hill Country with award-winning wineries, unique restaurants, and Lake Travis water recreation. Enjoy Austin's homegrown movie theater, the Alamo Drafthouse. Find the best Tex-Mex food right around the corner. Take a 20-minute drive to Downtown Austin and dine in some of the best restaurants in the nation: Congress, Uchi, Jeffrey's, Shoreline Grill...to name just a few. Take a 10-minute drive and dive into the "Austin Weird"-scene on South Congress Avenue. You'll find unique shops and a thriving food trailer community, offering a large variety of famous Austin eats. Shady Hollow homes are still in the affordable range for the average home buyer. For more in-depth information, check out the website of Shady Hollow residents and Goldwasser Real Estate agents David Schneider and Philip Myers: Shady Hollow Austin. chefkeem, Thank you for the images, information and video. Do you know what the average lot size is? A selling point is contributing a portion of sales to the school system. It's nice but the thing is: I prefer North Austin. Some of my kids live south. Very nice article on Shady Hollow....and so close to some great tex-mex eateries. Shady Hollow looks lovely, I even like the name. Very informative for people lucky enough to be moving there. Well! The Shady Hollow Homeowners Corporation did a great job. I wish to have more of them in other cities as well. It really is a beautiful preserved place. Shady Hollow sounds like a wonderful community to live and play in. I think you will have to do an article on those food trailer communities...you have my curiosity at a pique!